So today Daddy Day Care was reconstituted as the little guy was a bit sick and we decided not to send him to daycare. The daycare workers said they would miss him. I'm not sure they would had felt that way had they seen him today. He was definitely out of sorts and wasnt sure what he wanted. Thankfully he had a couple of good naps. He didn't really enjoy his walk either. The pouring rain meant that he was ensconced in his plastic cocoon. 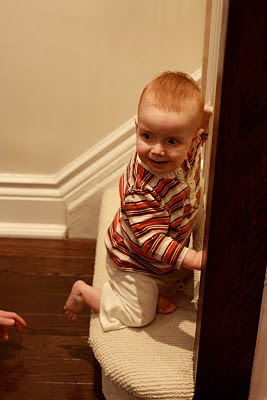 He did learn how to crawl up the stairs though. Little monkey. Here's hoping he has a good night and everyone can sleep in on Saturday morning.